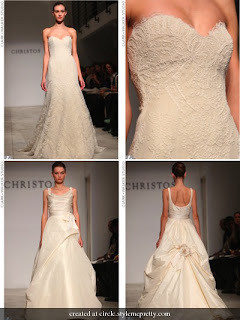 And no, I am not talking about your future husband or wife - I am talking the dress. The dress for me is something which I have mixed feelings about - which probably will come as a shock to all my friends, as they know my weakness for BCBG dresses, but the inflation of price tag, name brands and overall pretentious feelings I get from the whole dress buying process is one I can't really explain. Let me clarify, that I think the dress is one of the most gorgeous focal points of the day, and makes for some magical photographic memories, but I don't think this translates into the need to take out a loan, line of credit or re-mortgaging your home to get one! This is one detail I have no clue about for my own big day. One thing I know, is that I will not buy a dress based on the label nor whether it costs me 6 or 7 pay cheques. What I think clouds some brides judgement when it comes to dress shopping are the visuals in their heads. They see one of their friends, or a bride in a magazine wearing a sweetheart, dropped waist ballroom style dress, and it becomes this vision that they must acquire for their big day. I am a firm believer that if a dress doesn't look good on you, it does not matter anymore, you cannot buy it. 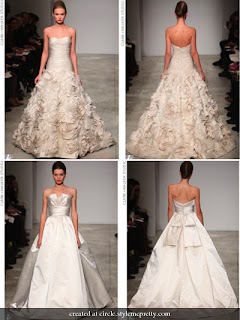 Every bride wants to look stunning on their big day, so why choose a dress based on what it looks like on someone else? Recently, I helped Alison pick out her beautiful dress, and I must say, I had a fleeting moment where I thought to myself "hmm - now THAT is something I would wear on my wedding day", but what do I know? It looks gorgeous on Ali, but could look entirely different on me. Regarding the silhouette, I have no ideas as to what I would want or look good on me, so come the day, I will probably try on every style out there. One thing I DO know is that I want an element of couture, even if it's not "true" couture (which would mean I would be spending a few dozen pay cheques". I require a few non-classic touches to my dress, feathers or flowers, something unique. I also believe that the dress must match the occassion - flowy, casual for the beach, lace for a classic and elegant wedding and a mermaid silouette with a cage veil for a more retro-chic look. The dress and the venue are usually two elements that need to be decided on to build the foundation of the wedding and then everything else is built on that. 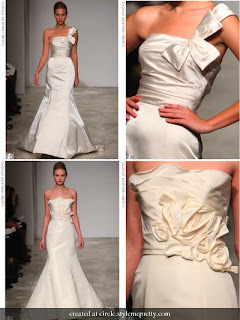 When it comes to name brands on wedding dresses, in New York, or Paris, big fashion capitals this may matter - but I have yet to this day not met a bride who made a huge deal about what designer made her dress, how much it cost and how exclusive she is. This is not to say you cannot tell cheap fabric from silk, but a silk dress found in a local shop and a silk dress purchased from Christian Dior may not stand that far apart from each other - and really, does it matter? As long as it looks amazing and you 100% believe it is "the one", then no one cares if it costs you $500 or $5000. With the bombarding of wedding shows coming out this year, I must say, the PVR is getting a great workout - one of the ones I love is Say Yes to the Dress. 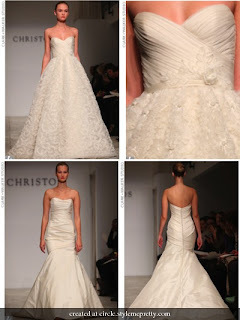 The show is based in New York at a premiere bridal shop by the name of Kleinfeld. By watching numerous episodes, I realize how exclusive a shop it really is - when someone says $2500 for a dress is a tight budget it makes me wonder "well what is average? ", but this is what I am saying. We live in Calgary, where $2500 would be on the higher end of the price range for dresses. On one show, a bride came in with a very specific dress in mind - and it came with a price tag of over $25,000. My jaw literally hit the floor - the parents bargained with the sales associate to buy the floor model and the family acted like they had won the lottery when the "scored" the dress for a cool 12 K. Wow. My role as a wedding planner constantly fluctuates - some day's I can wear the hat of the best friend - being supportive and encouraging, other times I may need to pull out my mom instincts and try to present the practical side of things. At the end of the day - if I have a glowing, radiant and truly joyful bride, I feel like my job is done. I also feel as though I have the best job in the world. As much I am am very indecisive on what dress I would ever choose, this gorgeous dropped waist number with massive fabric rosette's really caught my eye (http://circle.stylemepretty.com/), maybe I do know what I am looking for!